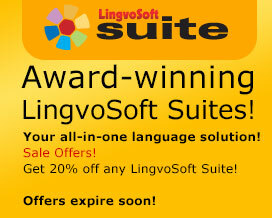 The LingvoSoft Thai Platinum Pack is a superb superb of LingvoSoft software featuring the Thai language. It equips you with advanced applications for all the devices you have now or will have in the future. If you are a student of languages, a businessperson dealing with Thai partners, or a frequent traveler to the Thailand, this comprehensive package will cover your needs in a convenient and cost-efficient way. LingvoSoft Suite English <-> Thai for Windows Mobile is a universal language management and translation solution for devices running Windows Mobile. This fully integrated collection of the most popular and efficient LingvoSoft titles answers the needs of anyone who uses foreign languages for business, travel or study.